on the Essential Needs in our community. Thank you to all who attended, sponsored and served at the 2018 event. More than $27,000 was raised! 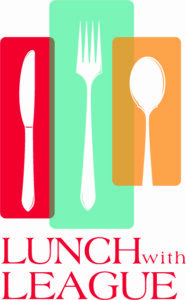 Mark your calendars for the next Lunch With League on Friday, Nov. 8, 2019. Lunch With League is the Junior League of Lansing’s largest annual fundraiser. The funds raised from Lunch With League go to organizations and community projects that provide essential needs including food, shelter and access to those who need it most. Help the Junior League of Lansing give back to our community by purchasing a ticket to Lunch With League! Can’t make the event? Donate by giving a Celebrity Server a tip!